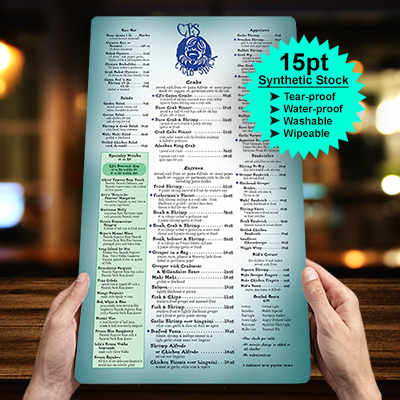 Restaurant Menus Printed in Full Color on a 15pt Synthetic Stock. Tear Proof, Water Proof, Wipeable, Washable Menus by Elite Flyers. Restaurant Menus Printed on a 15pt Synthetic Stock, made of special materials that give these menus a tear and water proof feature.. 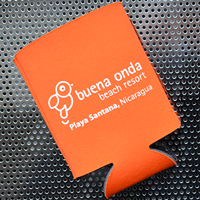 Printed in Full Color on Premium All Weather 15pt Synthetic Card Stock. Available in increments of 10, 25, 50, 75, 100, 250, and 500. 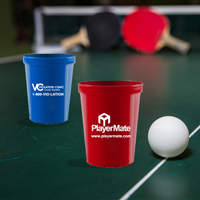 Available with UV Gloss Only. Restaurant Menus printed on 15pt synthetic stock are the menus you want to use when you want to make a lasting impression. Comprised of Specialty Materials, these menus have a tear and Weatherproof feature that will allow them to last for years. These premium quality menus are printed in full color on 15pt all whipable/washable synthetic stock with a UV Gloss Finish. Order your 15pt All Restaurant Menus Today!